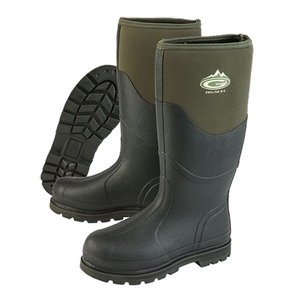 Grubs Eskline 8.5 Wellington Boots. A wellington combining Grub's unique Insu-Foam Ultra technology with advanced 8.5 thermal engineering. This classic field boot is ideal for most work or leisure activities with the addition of a Highloft fleece lining for added warmth. Features Traxion outsole with Duralite mid-sole Duraprene technology. All Grub’s footwear use self-insulating INSU-FOAM ULTRA bootie construction which is super soft and super bouncy, with a compression set of less than 7% verses 20-25% for other neoprene boots, so they remain soft and comfortable for much longer. INSU-FOAM ULTRA has a fine micro cellular structure, which stops heat transfer through its structure. The bootie exceeds the long-term effectiveness of waterproof membranes and lofted insulations, such as GORE-TEX and 3M Thinsulate. Using a super stretch Chloroprene material, commonly used in deep-sea dry suits, this material has a 300% stretch and is covered with a 4-way stretch knitted nylon jersey. This means the bootie can stretch up to 150% as a laminate with our super dry, moisture wicking terry knit lining. 8.5 Technology uses Insu-Foam Ultra booties with polyester fleece lining combined with Highloft liner, made from thousands of tiny fibres that allow air to circulate and trap heat, like down feathers. The liner wicks away excess perspiration and creates a comfortable temperature range of -40°C to 15°C. Grubs is the only brand that uses self hardening layers of epoxy impregnated material to stiffen the toe and underfoot chassis of our boots to give a sure footbed platform and a protective toe that can take the same sort o f knocks as high end mountaineering footwear. A removable 6mm Nitrocell footbed adds further insulation and cushioning due to its microscopic closed cell nitrogen bubble structure, giving the wearer superior thermal protection from cold surfaces. All rubber boots have a tough 2mm natural rubber shell and the safety boots have extra layers of rubber. Best wellies Ive ever had!Im a landscaper so I need warm comfortable but durable wellies.They grip my calfs well they dont rub and my feet are never cold.Wont ever buy a different brand again! These must be the warmest wellies on the planet! Super comfortable durable and warm warm warm!